There is no team in the NHL that has frustrated me more lately than the Dallas Stars. Each of the last three years I have liked a lot about them and have been bullish on them. In 2015-16 they rewarded my faith, compiling the best record in the Western Conference and making the second round of the playoffs. The year before and the year after that run, though, they underachieved massively. They finished sixth in the division both seasons and were no real threat to make the playoffs. There is a ton of talent at the core of this team, but goaltending has repeatedly kneecapped them. They got aggressive on that front this year, though, and did a lot to change their defensive fate. How bad was it? They allowed 264 goals last year. The worst playoff team in the West, Nashville, allowed only 224. That's a difference of almost a half goal per game. Dallas had a goal differential of -39. Only one playoff team had a negative goal differential, and Ottawa was at only -2. This team was not anywhere close to competent enough on the back end. If they fix that then they have a real chance to shine. It started in leadership. Lindy Ruff is a good coach, but he obviously wasn't an ideal fit in Dallas. His time came to an end. To replace him they looked to their past, bringing back Ken Hitchcock, who coached the Stars for parts of seven years and won their only Cup in 1999. Hitchcock was available after he was fired midseason in St. Louis last year. He'd finished first or second in the division five straight years there, but the lack of a playoff breakthrough had tested patience. Hitchcock is a very defensively-minded coach, so he is well suited to address the issues the team has. The first thing the team needed to deal with was their horrid goaltending, and they quickly turned a weakness into a strength. They had to pay handsomely for Ben Bishop, but they grabbed the top free agent goalie available. Bishop is an elite goalie that started more than 60 games three straight years for Tampa Bay, and he will have an immediate and significant impact on this team. They weren't done there, either. Defenseman Mark Methot was, somewhat surprisingly, left exposed by Ottawa in the expansion draft. Vegas claimed him and then traded him to Dallas. He's no superstar, but he's an upgrade for sure, and he has some nice playoff experience from last year, too. The team is now set up to have an interesting battle in camp defensively. On top of returning much of what they had last year and adding Methot, they also have two strong prospects coming to camp. Julius Honka didn't look great in 20 NHL games last year, but he was very good in the AHL, and the 2014 first-rounder should be ready to fight for real playing time this year. And the struggles last year meant the team landed the third pick in the draft, which they used on Finnish defenseman Miro Heiskanen. With a strong camp he could potentially factor in, too. The team seems happy to have a surplus of possible defenders right now, and you can be sure that Hitchcock will be relentless in the search for improvement with from this year. It's not just on the backend that the team tried to get better. They made two more splashes in free agency, grabbing Alexander Radulov from Montreal and Martin Hanzal, who finished last year with Minnesota but who had spent his career with the Coyotes. Both guys are nice fits, though the team will have to figure whether Hanzal or Jason Spezza, both centers who haven't played much on the wing, will stay at center on the second line and which one will have to play out of position. 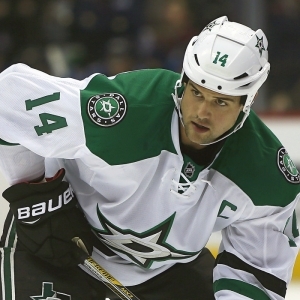 Radulov will likely start on the wing of the top line with Jamie Benn and Tyler Seguin. If they have chemistry then that could easily be one of the very best lines in hockey. This team had an absolutely stellar offseason. The goaltender is approximately 6.4 million times better than it was last year, the pieces are in place for defensive improvement, and a talented offensive team only got better. The coaching change is very strong, too. The team was just lousy last year, and injuries were a big issue, but if they can stay healthy and focused on their goals then the sky is the limit for this team. October is a very interesting month for this team. They open up by hosting the Golden Knights for the first regular-season game the franchise will ever play - and the first game they will ever lose in all likelihood. Then the Stars travel to St. Louis - a game you can be sure Hitchcock has had circled since the day he was hired. The rest of the month they play two each against Colorado and Arizona and play Vancouver and Detroit once each. Those four teams and Vegas are the worst in the league, so it's a soft start for the team, and they have a chance to get off to an excellent start. Bovada has Dallas tied with the Blackhawks at +1200 to win the Stanley Cup, third behind only Pittsburgh and Edmonton. That price is more than fair. BetOnline has them as the third choice to win the Western Conference at +700, tied with Anaheim and Nashville and behind Edmonton and Chicago. In a very tight Central Division they sit at +375, tied with Minnesota and behind Chicago and Nashville at +350. The season win total sits at 43.5. Last year they won 34 games. I am very high on this team. In fact, they are my pick to win the very tough West. I believe in Bishop, think the defense will be improved, have faith in Hitchcock, and just love that top line. There is massive value in the "over" on the season win total. I have been high on them for four years now, but this time around I have to ignore far fewer concerns to back them. Doc's Sports is offering free NHL picks to new clients. You can get free hockey picks by clicking the following link. No credit card is needed and there is no salesman to deal with. You try the picks, and if you like what we offer then you will be able to purchase one of our fairly-priced hockey betting packages. Click here to get your $60 in free picks . Also, for a limited time get three hockey handicappers for the price of one! Click here for our 3-for-1 NHL picks offer . What's Next for Tampa Bay Lightning After Epic Playoff Collapse?